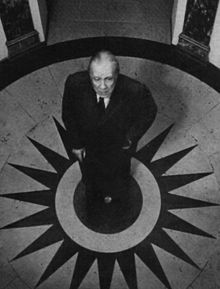 Jorge Luis Borges (August 24, 1899 – June 14, 1986) was an Argentine writer. He was best known in the English-speaking world for his short stories and fictive essays. Borges was also a poet, critic, translator and man of wisdom. He was influenced by authors such as Dante Alighieri, Miguel de Cervantes, Franz Kafka, H.G. Wells, Rudyard Kipling, Arthur Schopenhauer and G. K. Chesterton. "The central fact of my life has been the existence of words and the possibility of weaving those words into poetry." This page was last changed on 9 March 2015, at 19:20.